The Humboldt Ensemble is the name of a group of musicians specialising in chamber music from the Baroque era. For those of you not too well clued-up on so-called "classical" music, "chamber music" refers to performances of works needing only small groups of players, such as string quartets, piano trios, or pieces involving a solo instrument accompanied by piano. The "Baroque" era is generally held to be the 17th century and perhaps the best-known composer from this time is J. S. Bach. It was named after German naturalist and explorer Alexander von Humbolt. 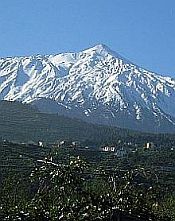 Living from the 18th to the 19th century, he visited Tenerife during his travels (finding time to climb Mount Teide) and found it enchanting. As he was closely associated with composers of the time, such as Mendelssohn, the Ensemble took his name. It was founded, comparatively recently, by two people. Mark Peters, born in California, was, up to 2007, principal cellist with the Tenerife Symphony Orchestra. It was then that he left, to devote his time to performing with smaller, more intimate groups. Maria Warecka was born in Vienna and specialises in Baroque violin. She has had an illustrious career, finally settling in Tenerife in 2008, where, as well as partaking in concerts, finds time to teach at the Academy of Early Music in Puerto de La Cruz. Alongside the Humboldt Ensemble, Mark and Maria have also founded theMélolas series of concerts. As well as Baroque music, other classical periods are represented, using such combinations as cello and piano, clarinet trios and vocal performances with piano accompaniment. These concerts take place in All Saints Catholic Church, in Taoro Park, Puerto de La Cruz and usually include complimentary wine and tapas afterwards. These events occur three times a month.